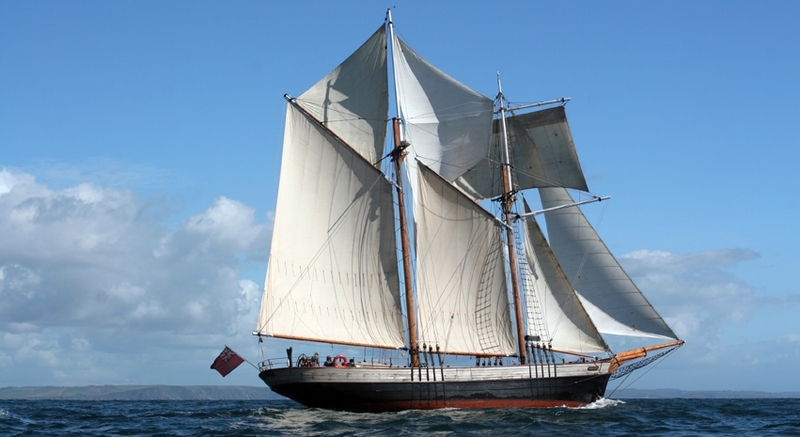 These are exciting times for The Island Trust following the success of our recent fundraising campaign and the purchase of beautiful topsail schooner Johanna Lucretia. As a result we will be able to support many more disadvantaged and disabled young people every year. As she is currently the only UK flagged topsail schooner in sail training, she is guaranteed to draw attention wherever she goes. In order to ensure that Johanna Lucretia is entirely suitable for the young people that we welcome on board each year, we are now seeking to raise a further £86,000 to carry out internal reconfiguration works and other changes over the winter of 2019/2020. These works will bring her up to our preferred specification, and will realise our ambitions to be able to undertake longer voyages, further offshore, giving a new generation of young sailors the opportunity to explore new challenges and greater destinations with The Island Trust. Like our other vessels, Johanna Lucretia is rigged traditionally, with lots of sheets (ropes) to pull and a wide array of sails means there is plenty for everyone to get involved with! The topsail schooner is arguably one of the most versatile of all sailing rig types, being able to sail quickly close to the wind with her fore-and-aft sails like our other vessels, but also has excellent downwind performance with a square topsail and course. Her large decks are ideal for group activities and spacious enough for the large bean bags used to ensure the comfort of our disabled beneficiaries. Built in 1945 at the Rhoose shipyard in Ghent, Belgium as a fishing vessel, she was never used for this purpose but laid as a completed hull and deck for several years and was converted for recreational use, under the Dutch flag in 1954. She is no stranger to Plymouth waters having been purchased by Mrs Heather Henning in 1989 who registered her as a British vessel with a home port of Plymouth. In 1991/1992 she was refitted to her present configuration. She has had only a handful of owners over the years, and has an interesting history, including a few film and television appearances. In 1978 she took the part of the Medusa in British spy thriller The Riddle of the Sands. In 2006 she featured in the film Amazing Grace, a drama about William Wilberforce’s campaign to end the slave trade. She also starred in the Irish reality TV show Cabin Fever in 2003, where she replaced the original Cabin Fever ship after it ran aground off Tory Island. Throughout the autumn and winter Johanna Lucretia will undertake sea trials and staff training, as well as maintenance work, and will commence youth sail training in spring 2019. She will be available for a small number of commercial and private charters and we will be running a few voyages during the season for adults, proceeds of which will support the Trust’s charitable activities. Hi, It’s Gracie here. I just wanted to write personally to say how much I’ve loved the two sailing trips that I’ve done with The Island Trust. They’ve been some of the best experiences of my life and have sparked a love of sailing that I hope will last for a lifetime. Please tell all the crew how inspired I’ve been by them as people and as sailors and how much I’ve appreciated the amount of effort they’ve obviously put into the trips. I’m really hoping to do more with you guys in the future and to continue sailing FOREVER! Good Morning, Merthyr Tydfil Youth Service (MTYS) has a commitment contained within our Youth Offer to the Young People of Merthyr Tydfil and therefore built into our Youth Service Strategy to engage in challenging activities in each of our youth settings. This is a core key performance indicator, but our partnership with The Island Trust since 2014 has enhanced this offer and made a significant impact upon the staff teams’ ability to deliver a programme that dramatically impacts on Youth People’s ability to communicate, alter behaviours, mature and engage with our programme, within both youth settings and as part of an offsite activity. There has been a noted increase both in engagement and participation by young people. Within MTYS the concept of participation is to support young people to engage in activities and to assume ownership of them. This is a concept in agreement with The Island Trust ethos of volunteer led activities and has gone some way in enabling the Service to meet its annual KPI’s in each setting. Additionally the ability of the Service to access accredited training and qualifications has meant that our partnership has impacted upon our ability to ensure that we raise the attainment of young people and to make them more employable and able to seek further training and development. Participation on The Island Trust sailing expeditions also broadens the horizons of young people living in post-industrial Welsh valley communities and is an important tool in our ability to illustrate to participants that whilst they might be part of a community they are also national and global citizens. I hope that our association continues for many years to come.